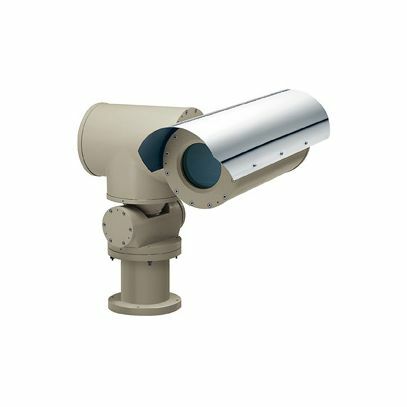 The robust, explosion-proof EXPT pan & tilt range has been designed for use in areas where there is a risk of explosion. They have attained Ex d certification for Zones 1 and 2 (Group IIC for gas) and Ex tb for Zones 21 and 22 for dust. They won't break under stress and are resistant to corrosive particles in the surrounding atmosphere, cleaning agents, saline mist and extremely low temperatures. The EXPT Pan & Tilt is characterised by the absence of external rotating cables, for easy installation and safe operation of the device. The Pan & Tilt units EXPT are made with strong Anticorodal aluminium die-cast alloy of AISi 7Mg EN - AB 42000 group. The P&T functions are controlled by the EXDTRX telemetry receiver.